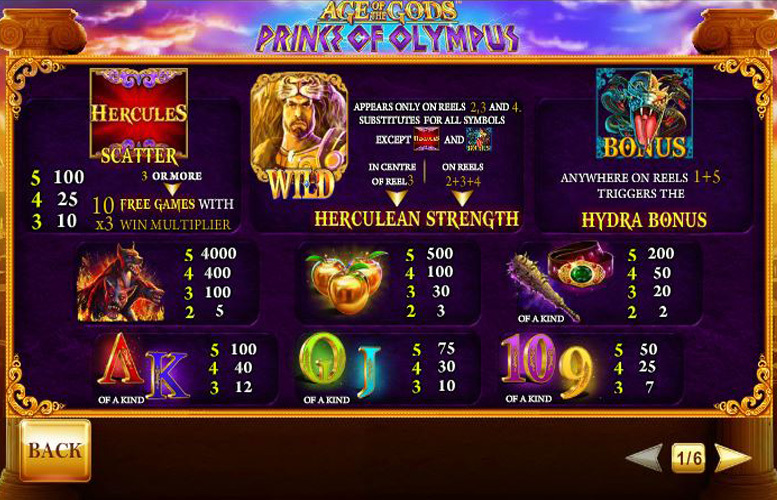 One of the latest additions to Playtech’s range of Ancient Greek inspired slot games, Age of the Gods Prince of Olympus is a five reel and three row slot which is themed around the legendary exploits of Hercules. Linked to four different progressive jackpots and offering sizable payline jackpots of its own, Prince of Olympus can indeed see players walk away with a princely sum and also boasts loads of fun and innovative extra features. Prince of Olympus is simply jam-packed with extra features which add both interest to gameplay and extra ways for players to win through the slot. Those extra features, including wild symbols and a bonus game, are really well matched to the slot’s overall theme. A jackpot game can be randomly triggered, giving players the chance to win one of four progressive jackpots. Line bet options are perhaps a little limited when compared with those available when playing other Age of the Gods titles. Those more limited line bet options mean that the game’s top payline jackpot is also comparatively less generous than some of those available elsewhere. Before we get to the additional features of the Prince of Olympus slot, let’s deal with the nitty gritty of how players can receive the biggest jackpot possible (aside from the four progressives). Being a five reel slot, the top jackpot results when a five symbol combination of the game’s most valuable symbol lines up along an active payline. The symbol in question is the slot’s symbol depicting the three headed dog Cerberus, and five of them in combination pay a jackpot worth 4,000 times the player’s line bet. The highest line bet that any player can select is £20, meaning that the top payline jackpot can be worth a maximum £80,000. Building on the slot’s overall theme, Prince of Olympus includes loads of additional features all based upon the legendary exploits of Hercules. These include a wild symbol with related ‘Herculean Strength’ feature, a scatter which triggers free spins and a Hydra Bonus Game. The Prince of Olympus wild symbol depicts Hercules himself and can appear on reels two, three and four. Wherever the symbol appears, it substitutes for all other regular symbols in order to produce the best payline combination possible. If it appears on either the central space of the reels or on all three of its possible reels at once, it also triggers the ‘Herculean Strength’ feature. When that featured is triggered in the former fashion, the wild expands to cover all of reel three and stays in place for two re-spins. If the feature is triggered in the latter way, all of the wilds expand to cover their reels for one re-spin. If three or more of the slot’s scatters appear anywhere on the reels, players get the double benefit of an instant win and the triggering of ten free spins. All of those free spins, too, are made even more valuable by the automatic application of a three time multiplier to any wins they trigger. If the bonus symbol depicting the mythical multi-head hydra appears anywhere on reels one and five after a spin, it triggers the Hydra Bonus Game. In that game players must fire arrows at the hydra’s heads for cash prizes and slash at the hydra for win multipliers. Alongside those Hercules themed features, Prince of Olympus is also linked to the Power, Extra Power, Super Power and Ultimate Power progressive jackpots. If the jackpot game linked to those is randomly triggered, the lucky player can play it in order to decide which of the four they win. In common with special symbols described above, the regular symbols of the Prince of Olympus reels also show off images from the legendary tales of Hercules. After the Cerberus symbol, which we have already discussed, the next most valuable are the golden apples symbol, the club symbol and the belt symbol. As is the case with all symbols, the best combinations of those three are those which see five of them appear along an active payline. Five of the golden apples pay a jackpot worth 500 times the line bet, whilst five of a kind of the club or the belt symbols pay out at a rate of 200 times the bet per line. When they wish to change the amount they want to bet for each spin of the Prince of Olympus reels, players can alter both the number of active paylines and the size of their bet per active line. 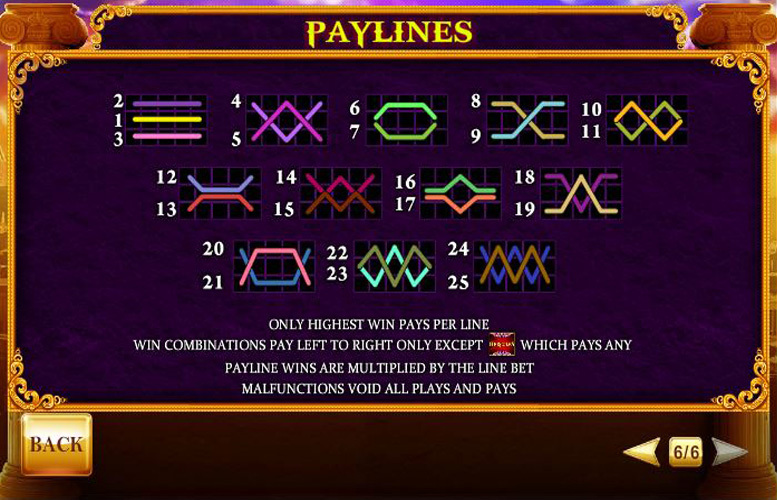 There are 25 paylines in total and players can choose to activate all of them, just one of them or any other number in between. When it comes to line bet options, meanwhile, the minimum possible is 1p and the maximum stands at £20. In total, therefore, the minimum possible bet per spin is 1p and the maximum if £500. 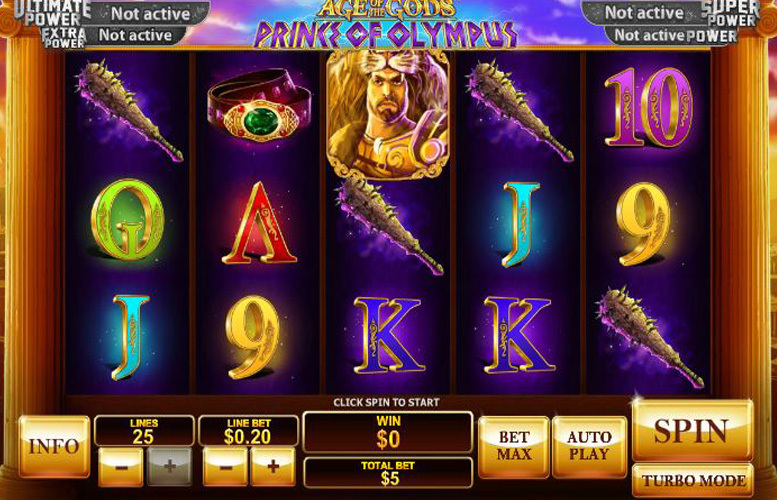 All of Playtech’s Age of the Gods slots are popular with players, but it’s hard to argue that Prince of Olympus isn’t amongst the best of them. It does, after all, provide a heady combination of immersive gameplay, fun additional features and the ability to win impressive jackpots. The Prince of Olympus features, including free spins, a bonus game and ‘Herculean Strength’ expanding wilds make the game far less repetitive than some and also enhance winning potential impressively. Like all other Age of the Gods slots, too, Prince of Olympus still boasts the link to four progressive jackpots which attracts many players. If there is a weakness with this slot, however, it is in its comparatively small range of available line bet options. Having a maximum line bet of £20, after all, will upset some higher rollers and also serves to keep payline jackpots a little lower than with some slots. This game has a rating of 5 / 5 with 342 total reviews by the users.